This was a quiet week at the theater, but a busy week getting things ready. We worked on several projects as well as continued our work for 2019. Our volunteers do a great job keeping things on track and on time. This week we have two fun things at the theater. 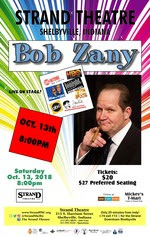 On Saturday we will provide that “ah ha” moment and a blast from the past. The Shelbyville High School Class of 1968 will tour the Strand as part of their Fiftieth Reunion Festivities. Think back to 1968…the balcony was open, it was dark, it was private (at least in the back row)… these people have THOSE memories. It will take them back! The Strand is a generational venue and that will be proved once again on Saturday morning. The Class of 1968 had may classmates attend from near and far. One member of the class came back from California! 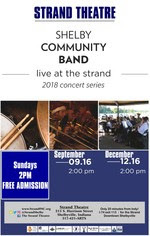 Sunday we welcome back the SHELBY COMMUNITY BAND for DANCING AT THE STRAND. This will be a great concert and is FREE. The concert starts at 2pm. The Shelby Community Band is our local concert band. They were founded in 1973 by forward thinking members of our community. Now in their 45th year, the band continues to entertain audiences with music from today and yesterday. Next week we welcome COLLY to the Strand. 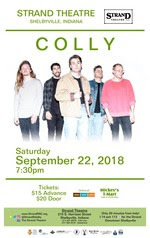 Their progressive rock will be presented on Saturday September 22, 2018 at 7:30pm. The Shelby County Players are gearing up for their production of ONE FLEW OVER THE CUCKOO’S NEST. Technical Director Greg Cox has things coordinated with the Strand for a smooth and (hopefully) easy load in. Every time we get another Strand project done, we can count on the Shelby County Players to use it first! Sometimes we need to do serious things. Once such thing is on the horizon. The Strand has been in operation for 11 years (hard to believe!). We need to revisit and rethink our mantra “Audience Safety, Audience Comfort.” This has served us well. This week we were incented to broaden the statement. Now it will be “Safety, Comfort.” We are starting a comprehensive safety training program for all our volunteers. Although young, we have just enough experience to be sloppy. We aren’t going to get caught in that trap. We have enlisted the help of wonderful business in Shelby County to guide us with our safety training. The Strand is a place for everyone. The past two weeks we welcomed six new volunteers. We enjoy meeting and getting to know our new family members. They bring a fresh perspective. We do this all because of you, thank you. See you at the Strand!